People are dying onstage in the Binda Theatre, and Brad Poer is responsible. The play is a murder-mystery as known in the industry for its twist ending as it is for being the longest running continuous play in history. Speaking about the production backstage before a recent rehearsal, Poer offers few details about play beyond its basic setup: As a blizzard rages outside a stately English manor, a group of strangers are trapped inside with a murderer. Complicating matters further is that no one actually knows who the murderer is, onstage or off. “It’s easy to be spoiler-ific,” Poer says, praising the Scooby Doo-like quality of the set, which features enough doors that characters can leave through one and seamlessly re-emerge through any other, facilitating confusion for the characters and the audience as to who is where at what time. Poer says the cast of eight – including six KCC students – each fall prey to the suspicions of the others, and hopefully the suspicions of the audience, at some point in the play, and he encourages theatregoers who don’t know the story to avoid using their smartphones to sate their curiosity during intermission. A veteran of the regional theatre scene, Poer had been teaching at KCC for three or four years before assuming his current role heading up the college’s theatre program last winter. In that time he’s seen a lot of growth on the academic side, he says. There were just six students in the combined Acting I and II class he taught simultaneously when he first started at KCC, he says, and this year the classes have been separated for the first time, with more than 20 students enrolled in Acting I and a dozen enrolled in Acting II. 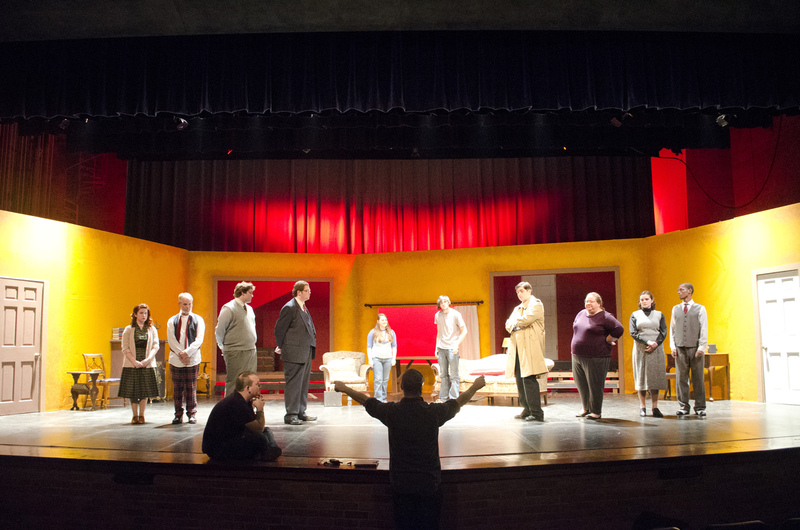 Poer directed his first play at KCC – the spring musical “Lucky Stiff” – last semester, and while he directed a number of plays before that elsewhere, this is his first murder-mystery. It’s also his first time directing a cast that will be speaking almost entirely in British dialect. While the characters aren’t necessarily caricatures, he says, they definitely fit models many in the audience will be familiar with. Poer says the play is relatively family friendly – there are themes related to death, obviously, but no terror or gore to speak of – and is particularly appropriate for audiences given the time of year.